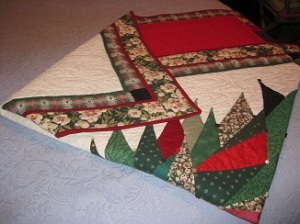 Quilts that get folded the same way all the time, develop creases that won’t come out. 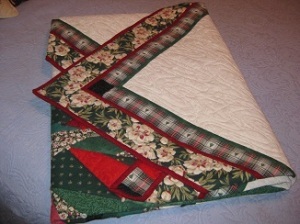 Folding quilts on the bias, helps prevent this, and it is easier to fold to a size that fits in your storage space. 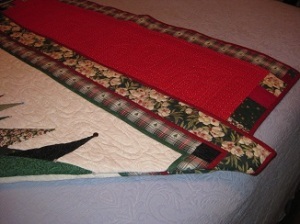 First, lay the quilt to be folded, pretty side down on a bed or large table. Grasp any corner and bring it to within 3-4 inches of the opposite edge. Next, working clockwise, grasp the point just made and bring it 3-4 inches past the opposite edge. Then, still working clockwise, grasp the next corner and bring it 3-4 inches within or just past the folded edge, or as in the photo below, I have folded so the edge to the front of the picture is twice the width of the shelf I will be placing it on. Now grasp the fourth corner and bring it to within 3-4 inches or just past the folded edge. My shelves are 18 inches deep so this bias fold is 18 inches from the front edge. Why 3-4 inches within or just past the point or edge? It prevents you folding in the same place, as it is harder to guess the same each time. If your quilt is bigger, you may need to fold the quilt in half a couple of times, but all your folds will still be on the bias. 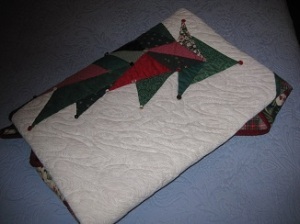 Here is the quilt folded in half once to fit my selves. You notice the quilt is folded pretty side out? 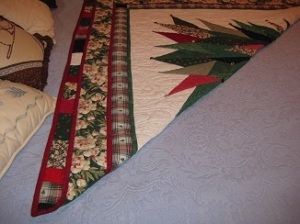 This makes any creasing that might happen if something heavy gets piled on the quilts be on the backside of the quilt. If you are concerned about them getting dirty, store each quilt inside a cotton pillowcase. Thanks. I wanted to know how to do this! enhance my website!I suppose its ook to make use of some of your ideas! !